Throughout history, man has had a need to establish a connection with God. In his quest to satisfy this inner need, the concept of an altar was created. In modern times, an altar is usually a table or chest where spiritual offerings, statues, pictures and others symbolic items are placed upon. The purpose of an altar is to worship or connect with God and spirit guides. It is a sacred space where the person goes to meditate pray, perform rituals or simply recharge their internal batteries. Growing up in a spiritual community, altars were a normal thing. I recall visiting my mother’s friends or family members and seeing an altar. Some were large, while others were of a smaller scale. The purpose was the same-a connection to the spirit world. 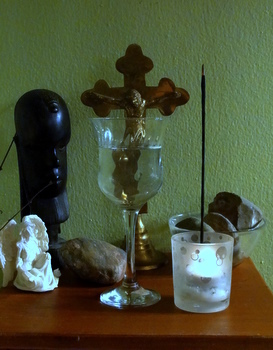 When I reached a certain age, I created my own spiritual altar. It was just a carbon copy of what I had seen in the past. As I began developing spiritually and connecting to my spirit guides, a diverse way of looking at things began to unfold. With the help of a spirit guide, I was able to go beyond the ordinary in order to understand the true meaning of a spiritual altar. It was explained to me that an altar is something very personal that should reflect the essence of the person’s spiritual development, with God being the center of all. When placing an item on an altar, one should know its purpose. 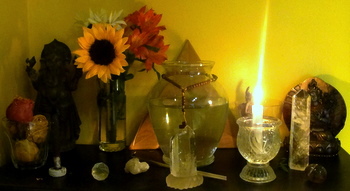 In addition, it is important to become aware of the energy that surrounds the altar. There are items that create a heighten level of energy, such as crystals. Certain spirits recommend having one or two crystals on the altar. However, not all altars need crystals. It all depends on what the person’s guides feel is necessary. 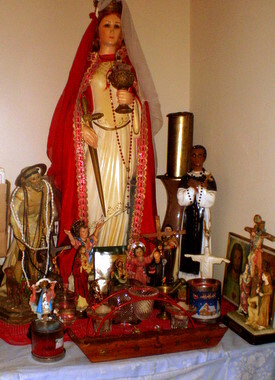 There are people who have statues of saints on their altars. These are saints they faithfully pray to, and are grateful for requests that were granted to them. It is important to know that no saint or spirit can grant requests without the permission of God. That is why a symbol representing God should be placed in the center of the altar. 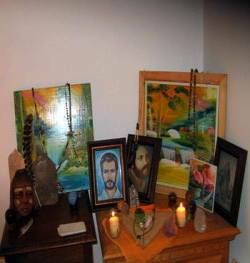 "My altar is composed of saints who have great meaning to me. They are saints whom I prayed to when I was experiencing problems. Moreover, it is the place I go to whenever I am in need of strength. There, I can relax and see things clearly." In Santeria, an altar is call boveda. A boveda is usually a small table with a white tablecloth over it. Seven or nine goblets of water are placed on top. The largest one is placed in the middle and dedicated to the person's main spirit guide. In Jambalaya by Luisah Teish, she gives a guideline on how to build a small altar. A piece of white cloth, crystal chalice filled with water with a tablespoon of anisette, white rum or white wine (this water is called spirit water), a white candle, four stones and pictures of ancestors are items needed to create an altar. In the Umbanda religion, an altar consists of the following elements-fire, earth, water and air. Recently, while attending an Umbanda ceremony, the person in charged explained the various items on the temple’s altar. There were three candles-fire element. 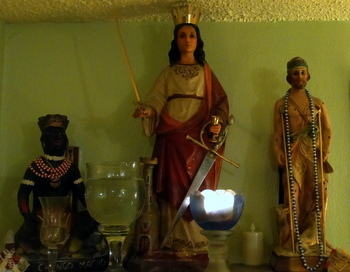 These candles were dedicated to specific orishas. I remember one was for Oshun-Goddess of rivers and love. In front of the candles was a glass of water- water element. Water clears and takes in all negative energy. Furthermore, located in front of the glass of water was a rock-earth element. Since orishas are earth spirits, it is paramount to have an item that represents the earth. The air element is self-explanatory. In this particular altar, extra items were placed, such as a small statue representing the principal guide of the temple, flowers, and a white solid substance similar looking to chalk. This chalk is called cascarilla. The chalk is used by the entities to write their names on the floor. In certain religions, cascarilla is used in cleansing rituals. Whatever kind of altar you have or are in the process of creating, it is important to remember that love is the main ingredient.